More than a decade ago, the chemical compound diacetyl, which is used to add flavor and aroma to foods and other products, came under fire after an investigation by The National Institute of Occupation Safety and Health exposed it as responsible for lung disease in several microwave popcorn plant workers. The disease, bronchiolitis obliterans—often called “popcorn worker’s lung” or “popcorn lung” —attacks tiny airways in the lungs, causing irreversible damage. Many popcorn plant workers contracted the devastating illness, and some died as a result. Now, air samples taken at coffee roasting facilities suggest that workers in the coffee industry could also be in danger from the damaging effects of diacetyl. The roaster sampling was conducted through an investigative effort by The Milwaukee Journal Sentinel, following the recent discovery of diacetyl-related lung disease in five commercial coffee plant workers in Tyler, Texas. 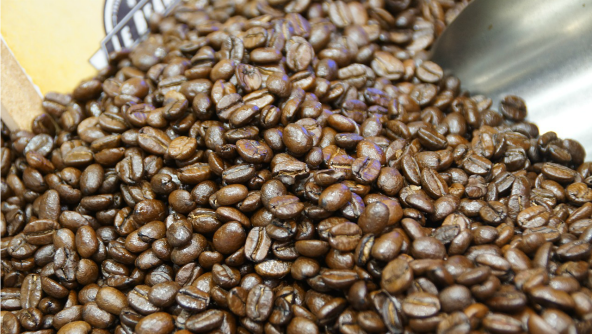 Working with an industrial hygienist and using methods approved by OSHA, the publication conducted testing at two Wisconsin coffee roasting companies to check levels of worker exposure to diacetyl and a closely-related chemical, 2,3-pentanedione. The results, detailed in a Journal Sentinel article this month, showed that exposure levels exceeded safety standards proposed by the U.S. Centers for Disease Control and Prevention (CDC)—in some areas by almost four times the concentration, which is comparable to the levels affecting popcorn plant workers in the NIOSH study from 2000. To most, diacetyl is an unexpected potential hazard in coffee roasting. This is because the chemical is most commonly known as an additive for products like popcorn, chips, and candy. More recently, it has also been identified as a suspected health risk in the electronic cigarette industry, where companies add it to liquid in flavor cartridges. In coffee—while it can be used as a flavoring additive—it also occurs naturally in high concentrations during the roasting of unflavored coffee beans. As the Journal Sentinel report points out, “naturally occurring diacetyl is identical in structure to the synthetic version found in flavorings and causes the same damage to the respiratory system.” While the U.S. Food and Drug Administration classifies it as safe to ingest in small amounts, multiple studies have shown it can be toxic when inhaled. Even so, the chemical is not currently regulated by OSHA. Regardless, as part of OSHA’s General Duty Clause, employers have an obligation to protect employees from recognized hazards like diacetyl—naturally occurring or not. As noted in the Journal Sentinel report, the U.S. Bureau of Labor Statistics lists over 650 U.S. establishments that manufacture coffee or tea as their primary business, employing around 20,000 workers (not including nearly 600,000 people working in smaller café roasteries, which are categorized separately). Clearly, the health hazards tied to diacetyl could have a significant impact. As always, it is critical for employers and workers to be aware of the possible effects and other important information associated with all of the chemicals they deal with on the job. To learn more about diacetyl hazards or other chemicals in your workplace, check out MSDSonline’s extensive database of safety data sheets.